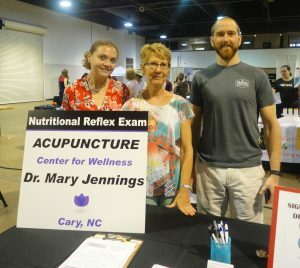 We had a great time at the Gluten Free – Allergen Free Wellness Event at the Raleigh fairgrounds last weekend. 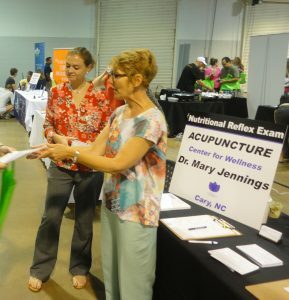 It was great to see and meet so many people who are interested in improving their health! Thanks to all of you who stopped by our booth to talk, ask questions and find out more about our clinic. Just in case you missed it, click on the button below to download a copy of our Healing Gluten Intolerance flyer. I am a firm believer that you are never too old to learn new things or start down a new path in your life. Change is hard, start small and don’t stop. Whether that change is to try a new recipe, start a workout plan, or to finally resolve a nagging health issue, be proud that you’ve started the process. You might be wondering, who is this man in the picture? He is Rob Arthur, a nutrition coach who I met while I was getting my car repaired. We hit it off with our shared interest in health and wellness. He was our booth-mate at the Gluten Free Allergen Free Wellness event. Check out his website to find out more about his coaching services. We all feel super motivated after attending a great event like the Gluten Free Allergen Free Wellness event. We’re filled with new ideas and ready to make tons of positive changes in our lives – right now. But then reality sets in, the motivation fades as you settle back into your daily routines. Don’t let that happen! I for one hope you’ll stay motivated, and I’ve got an idea for you to consider. Join me and other like-minded individuals at my new Meetup group – The Triangle of Wellness. Are you interested in health and wellness? Eating nourishing foods that don’t break the budget and taste great? Learning how to maximize your exercise routine within the time-constraints of your schedule? Want to be with like-minded people who are passionate about these topics? Wellness is not about just looking good on the outside. It’s an inside job! This Meetup is about the Triangle of Wellness — our structural/physical wellness, our nutrition, and our energy level —- all three need to work together. At our Meetups, we will learn how to optimize our lives, schedules and kitchens to achieve our life goals.